The Bastrop County Soil and Water Conservation District will meet in a regular session on Monday, December 10, 2018 at 8:15 AM at the FSA Conference Room at 507 Old Austin Hwy. in Bastrop, TX. Discuss and or act on Performance & Salary for Dist. Tech. The Bastrop County Soil and Water Conservation District may convene in executive session on any of the above items in accordance with Subchapter D, Section 551-071 – 551-076 of the Texas Open Meeting Act. 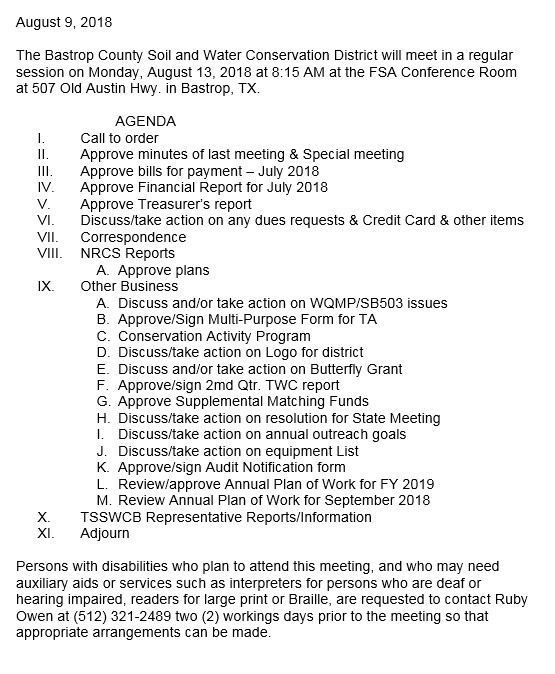 Persons with disabilities who plan to attend this meeting, and who may need auxiliary aids or services such as interpreters for persons who are deaf or hearing impaired, readers for large print or Braille, are requested to contact Ruby Owen at (512) 321-2489 two (2) workings days prior to the meeting so that appropriate arrangements can be made. The Bastrop County Soil and Water Conservation District will meet in a regular session on Monday, October 8, 2018 at 8:15 AM at the FSA Conference Room at 507 Old Austin Hwy. in Bastrop, TX.